1. Lots of interesting links this week! First up, The New Yorker published “Why Facts Don’t Change Our Minds,” a fascinating piece by Elizabeth Kolbert. Discussing at length the phenomenon of ‘confirmation bias’ — which suggests that we believe those facts that support our beliefs and reject those that challenge our beliefs — Kolbert ultimately confirms (bada bing!) much of what our own pop psych. archives have been saying for quite some time. Drawing from the work of cognitive scientists Hugo Mercier and Dan Sperber, and their upcoming book The Enigma of Reason, Kolbert argues that “reason” is a tool we have developed to help ourselves convincingly navigate our biases without giving away our truer, more vulnerable positions. Because the human race has long valued bragging rights over getting our facts straight, we tend to use “reason” to win arguments and protect our standing on the social ladder. Kolbert’s article is a provocative — albeit political — treatise on biases; however, in remaining staunchly sold out to the Science God, it’s not without its own blind spots. The studies cited are helpful in understanding the sorry state of the human condition, but they remain unable to engender change. Towards the end, Kolbert begrudgingly admits: “Providing people with accurate information doesn’t seem to help; they simply discount it. Appealing to their emotions may work better, but doing so is obviously antithetical to the goal of promoting sound science.” This may have something to do with why reception of the gospel is often such an emotional experience, why relief and truth seem — for many of us — inextricably bound up. 2. If we maintain any pretenses that technological innovations might fix the human error diagnosed in Kolbert’s article, then Ian Bogost, over at The Atlantic, has something to say to us. In his wonderful think-piece, “Nothing Works Anymore,” Bogost argues that we have begun working for technology — though technology should be working for us. In Bible-lingo, this means we can’t out-tech the curse of Genesis 3; though we spend all our time inside, we haven’t stopped tilling the land. This truth has been obvious for some time. Facebook and Google, so the saying goes, make their users into their products—the real customer is the advertiser or data speculator preying on the information generated by the companies’ free services. But things are bound to get even weirder than that. When automobiles drive themselves, for example, their human passengers will not become masters of a new form of urban freedom, but rather a fuel to drive the expansion of connected cities, in order to spread further the gospel of computerized automation. If artificial intelligence ends up running the news, it will not do so in order to improve citizen’s access to information necessary to make choices in a democracy, but to further cement the supremacy of machine automation over human editorial in establishing what is relevant. There is a dream of computer technology’s end, in which machines become powerful enough that human consciousness can be uploaded into them, facilitating immortality. And there is a corresponding nightmare in which the evil robot of a forthcoming, computerized mesh overpowers and destroys human civilization. But there is also a weirder, more ordinary, and more likely future—and it is the one most similar to the present. In that future…technology is becoming a force that surrounds humans, that intersects with humans, that makes use of humans—but not necessarily in the service of human ends. More specifically, you gotta serve somebody. 3. This documentary on addiction looks incredible. Screening in Dallas on March 4—tickets are free but required for admission. 5. For lighter fare, this week brought us a couple, uh, breathtaking stories. Here’s a humorous (but all too real) story about a “militant vegan” who was sued after veganizing her entire store and alienating her paleo faithfuls. Is it confirmation bias or the classic rebellion from the law (Rm 5:20) that radicalized Adami? Though her agenda was and is clearly unwelcome, Adami the Militant Vegan spends her time fruitlessly proselytizing to meat-dispensing restaurants. She says, “I have no doubt in my mind that the seed has been planted!” Isn’t that what you’re supposed to say after you’ve evaluated a stranger on the Engel scale? Weirder still is this story about French artist Abraham Poincheval, who is currently inside a rock? He’ll be self-trapped for a week in the Name of Art. Poincheval said his new performance, which he calls “Stone”, was “a voyage through geological time” where he would become the “beating heart” of the rock…His next performance Egg will begin on March 29, with Poincheval sitting on a dozen chicken eggs for between three and four weeks until they hatch. 6. 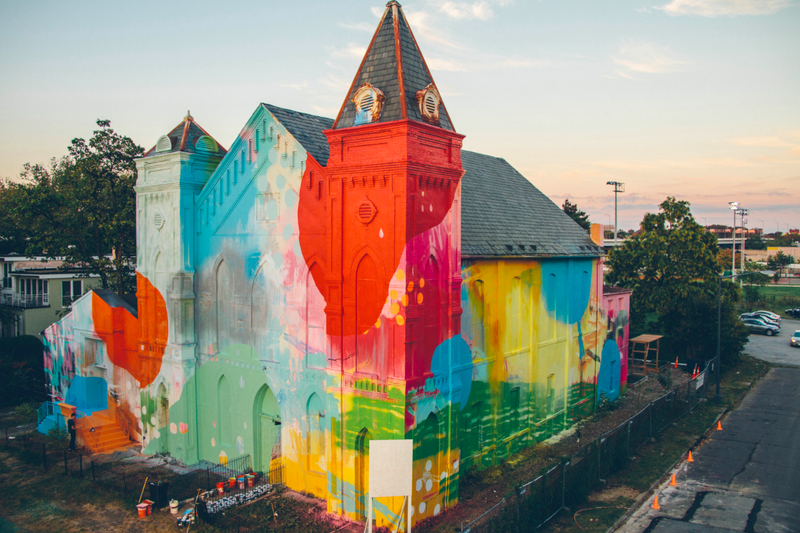 Here’s a great one by Anthony Esolen from The Wall Street Journal, excitingly titled, “Free Our Churches From the Ugly and Stupid.” Frustrated with outdated church aesthetics (and the people-pleasing that seems to go along with them), Esolen calls for an extreme makeover, church edition. I have heard for decades effeminate “hymns” with the structure and melody of off-Broadway show tunes. I have read hymn texts altered so as to obliterate references to God with the personal pronoun “He.” This music would not be acceptable for a jingle to sell jelly doughnuts on television. I have seen and heard enough. We must get rid of everything ugly and stupid from our churches, most of it visited upon them since the great iconoclasm of the 1960s. What’s needed is genuine art that stirs the imagination and pleases the eye, that entices the soul with beauty before a single word of a sermon is uttered. 8. 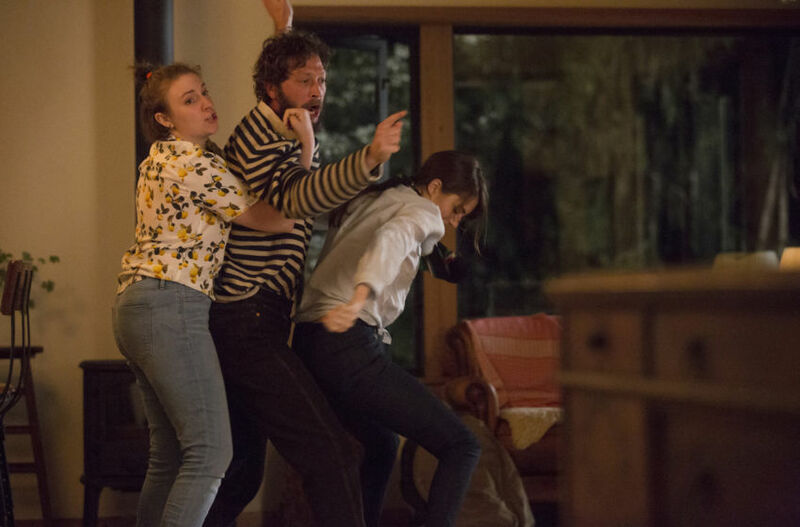 In addition to HBO’s newest Crashing (the premiere of which was fantastic), this week’s episode of Girls is definitely worth mentioning. We find Marnie in the midst of yet another affair, and her lover, Desi, says, “If you don’t believe in your own goodness, you can’t expect anyone else to.” “Do you?” she responds. “Do you believe in my goodness?” This question (with echoes of “Who is good but God alone?”) is central to the episode, titled “Hostage Situation,” which finds its characters definitively beyond the bounds of illusory sexual freedom and into the territory of addiction — very much in need of help resolving compulsive psychosexual behaviors. Even if we can be sure Hannah will not keep her promise, still, this is a huge development in a very slowly developing character. Which may have something to do with the fact that she, in the last episode, found herself in a very Marnie-like situation. Perhaps being at the bottom is the only way to rouse any real compassion and growth. 9. Hannah’s abandoning of moral superiority is perhaps the most wild thing she’s done over the course of six wild seasons — but that tight grip of superiority may be what rings most true about her character. Like Hannah, we often cling to our moral high ground like a safety blanket, and it may come as no surprise to find this at the beating heart of so much of our current political debacle. This week, The New York Times ran a surprisingly sympathetic article by Sabrina Tavernise titled, “Are Liberals Helping Trump?” It’s about a conservative-leaning moderate feeling bullied by moralistic opponents. As is so often the case for our interpretation of politics — a world of laws and reactions to reactions — rebellion is part and parcel of the above rhetoric. If I push someone, he’ll push back. As this article points out, recovery can happen when the opponents are too tired to fight back. As for the country, she is worried. A great followup to last week’s look at Donna Freitas’ new book: There’s No Crying on Social Media. This week, Emma Green from the Atlantic went toe-to-toe with The Benedict Option (The Christian Retreat from Public Life); with Dreher’s book hitting shelves in a few weeks, it will be worth revisiting DZ’s more sympathetic essay in response. A laugh from McSweeney’s: A Satirist’s Cheatsheet to this Year’s Most Anticipated Blockbusters. Lots of good reading recommendations from dear George Saunders, author of the overwhelmingly acclaimed Lincoln in the Bardo: our Mbird review is coming next week! Eyes peeled, everyone. I’m surprised no one at Mbird ever has written about Netflix’s Flaked. Considering a 2nd Season is up and coming, it’d be worth while. Will arnett is so cool to me (especially after his heartwrenching cameo in A Series of Unfortunate Events). Thanks for the heads up! A good part of what Forde says is that any “theory” moves the conversation from God’s loving work in Christ, into an abstraction. My “opposition” to the substitution motif is that it is reductionistic, and mechanistic. Forde does not (entirely) toss out substitution, but insists on a more wholistic and biblical reading, that in the end speaks to God actually working faith and forgiveness in the sinner (me) (you) through the cross and resurrection. I will close with this compelling line in Forde’s piece, (an article I have shared with most everyone I can over the years). . . Thanks Mbird, for so much thought provoking, faith encouraging, great stuff! -God gets angry in the Bible, and he has to be talked down from wiping out the Israelites after the Golden Calf fiasco. But God technically does not have emotion or change God’s mind, since immutability is a necessary attribute of God’s (Augustine in DT goes into this sort of speech about God which is technically wrong, but still properly used). -God is often called “Father” in the Bible and in theology, but Barth counsels us that God is more unlike than like even the best of human fathers. What I think those two examples show is that models of God break down at a certain point, and any of our images, metaphors, and models for what God does need be tempered with apophasis lest they become mechanistic or confining. But the models are still proper to a point. So I think substitution and, to me, participation too are good models, and I read Paul as leaning on both of them at times. But Forde’s caution applies to the extent that (i) they are only models and (ii) that the human heart will misuse theological images. Them be deep waters, but I think at least one issue is precisely where to draw the line between kataphasis and apophasis, so to speak. And perhaps it’s a matter of particular circumstance, rather than some timeless systematic picture, that motivates in part where that line is drawn (it certainly did for Barth, and the line seems to shift in his later work). Anyway, I love the Forde article, too, and think it’s immensely valuable. Any of our theories do risk covering over the brute event of the Cross itself. Yes, Forde points to the event itself, and our participation and responsibility in the brute reality of Jesus’ crucifixion. Yet he also points out that the image of substitution falls apart (or maybe caves in on itself) when one portrays the event of the cross as a price paid to God to satisfy God’s wrath. . . Yes, Christ dies in our place, but not to settle some bank account in heaven. Christ dies to save you. One of the key points Forde makes, is that the Church in her wisdom has never settled on a SINGLE “doctrine” of the atonement. Rather than a doctrine, we have the event itself. Which works its work when you die with Christ, and are raised with him to “live before God in righteousness and purity forever” to quote Luther’s Small Catechism. So, (I would suggest) rather than theories of atonement, or even worse, a doctrine of atonement, what we need, is 40 days of Lent, Holy Week, Maundy Thursday, Good Friday, Easter. . .